On the 2 December, Guernsey’s Legendary Guitars & Musical Treasures auction in New York will see some of the finest instruments in history go up for sale—striking a sentimental chord with music fans. Following on from their record-setting sale of Jerry Garcia’s guitar—lovingly known as ‘wolf’—which raised $4 million for the Southern Poverty Law Center, this auction promises to draw a considerable crowd. Collectors from far and wide will be drawn in to bid on some of the most noteworthy and rare instruments in musical memory. Guitars owned by Jimi Hendrix, Johnny Winter, Jerry Garcia and Steve Miller will feature in the auction alongside Bruce Springsteen’s bass that was played on his first album and Madonna’s first performance-used touring guitar. 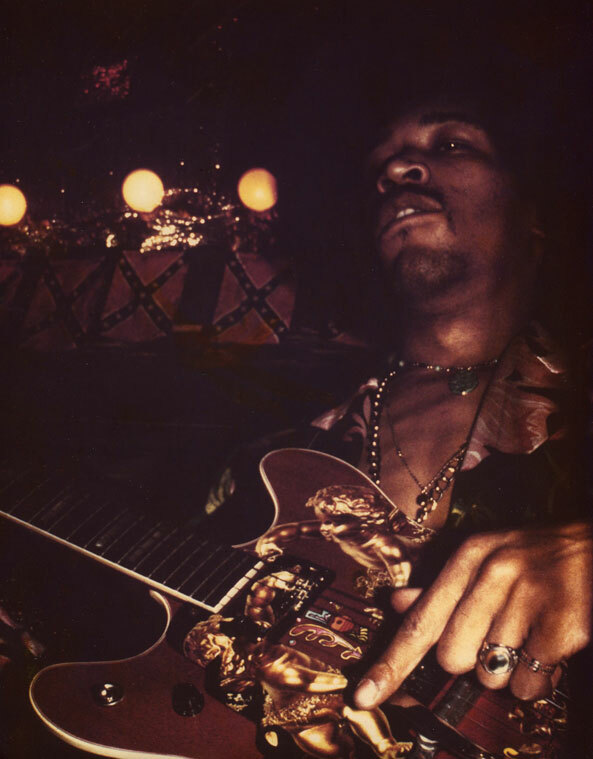 It is extremely rare for a Jimi Hendrix guitar to come to auction; the appearance of his sticker-covered Guild—which he played at the 1968 Miami Pop Festival—is therefore momentous. His guitar will be joined by the most extensive collection of unreleased studio tapes and Hendrix lifetime-issues vinyl records. The assortment of magnificent instruments range from 19th century classical and parlor guitars to century-old creations from the workbenches of masters Antonio Cerrito and Fermin Barrios. Guitars played by the folk legends John Denver, Cuban icon Vicente Guyun and Jacques Brel will also figure prominently in the sale. One section of the auction that is projected to draw a considerable amount of intrigue is the grouping of guitars owned by the American jazz and blues guitarist, Les Paul. During his long career he was known to send gifted instruments to artists whom he admired. Famous examples include Bob Dylan, Prince and Paul Simon. Many of these gifts were inscribed with humorous messages. Now, some of these curious objects of admiration will be captured in the auction’s spotlight. Guitars will not be the only instruments to fill the event: saxophones, handwritten music and numerous other musical artefacts will take pride of place—satisfying the attending jazz buffs. A collection of original tapes and unreleased recordings of live performances at the Boarding House, San Francisco will make an interesting addition to the occasion. The Boarding House was a popular club in the 60s where prominent artists such as Bob Marley, Patti Smith and Neil Young would perform. The Guernsey’s Legendary Guitars & Musical Treasures auction will be the event of the year for music fanatics. Keep an eye out on Arts & Collections for the auction results. If you have enjoyed this article: ‘Guernsey’s Legendary Guitars & Musical Treasures Auction’ on Arts & Collections, click here to read more about the history of luxury luggage.